Eldar Wraithknights are huge ghost warriors many times larger than even a Wraithlord – a Wraithknight is swift and dextrous even given it’s great size. 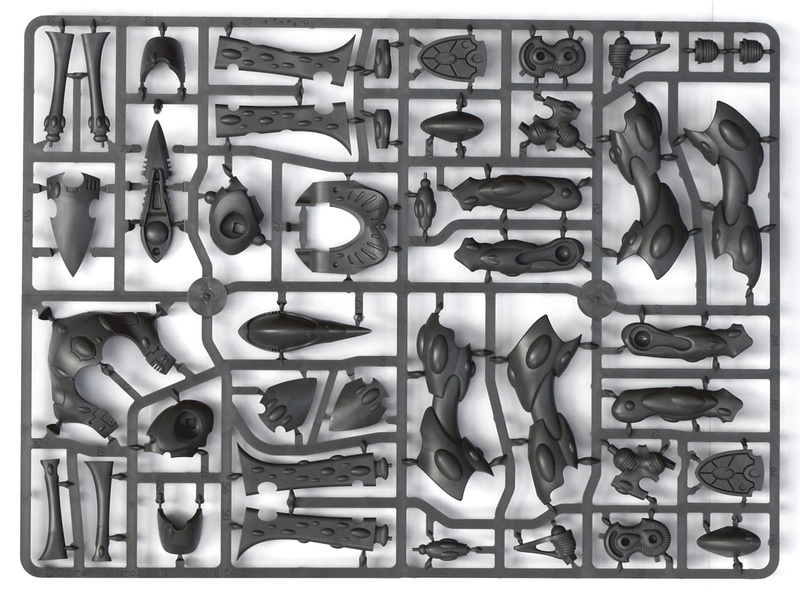 The Eldar Wraithknight boxed set contains 114 components and an Eldar Transfer Sheet, enough to build a single 9″ high Wraithknight model. The Wraithknight comes with two heavy wraith cannons but can be equipped with other weapon options including a suncannon, ghostglaive or scattershield. Additionally the kit comes with a number of shoulder mounted support weapons including: starcannons, shuriken cannons and scatter lasers. One of the first things I noticed whilst putting this kit together was the fact that the legs are not terribly poseable. 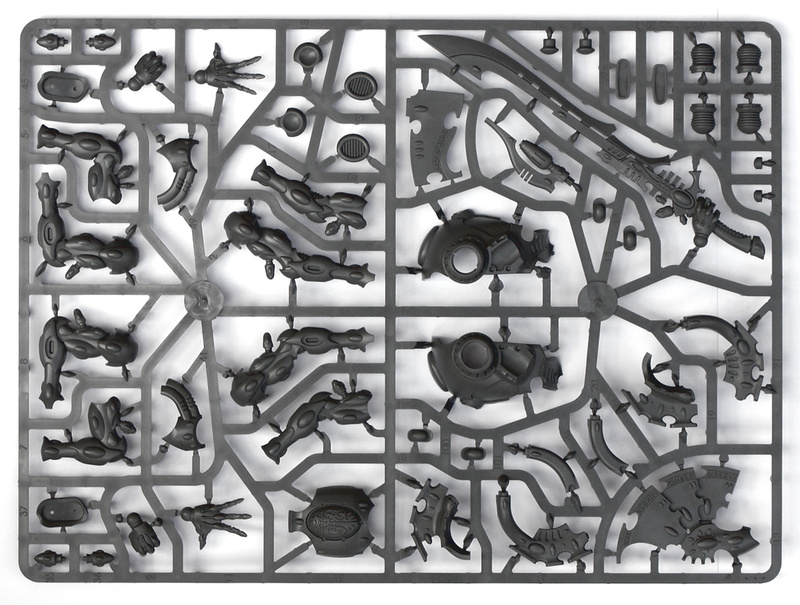 This is a major disappointment as the model begs to be posed leaping across the battlefield as only an eldar construct of this size could. 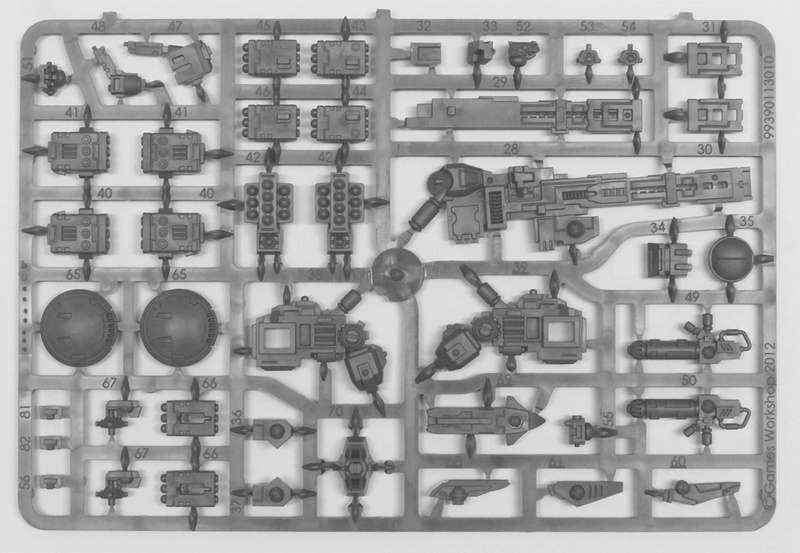 This is somewhat countered by the fact that there are two pairs of arms included in the kit allowing for a degree of posability and the option to attach different weapons to different sets of arms and then magnetising to get greater flexibility from the kit through primary weapon swaps. The Wraithknight was an easy build despite it’s apparent intricacy and nothing more than the occasional glance at the instructions was required. 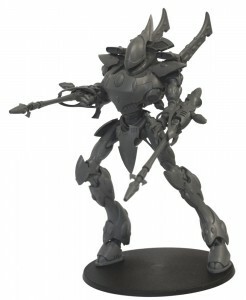 Once complete the Wraithknight makes for an impressive and elegant addition to any Eldar army. 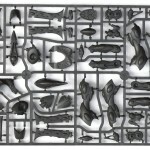 Taking a step back for a moment there is also another key difference to the Eldar Wraithknight boxed set – the box itself. It is of a new corrugated design and does not come sealed in cellophane. 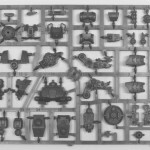 This is likely to be more robust, meaning your miniatures will arrive in tip-top condition, but is possibly less useful for storage (if you use miniatures boxes for model storage) than the old lidded design. 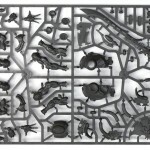 One other new feature of the new Eldar release is a more comprehensive painting guide on the box. 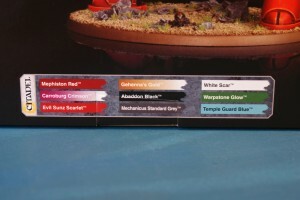 Previous versions listed a handful of colours that you might choose to paint your model. 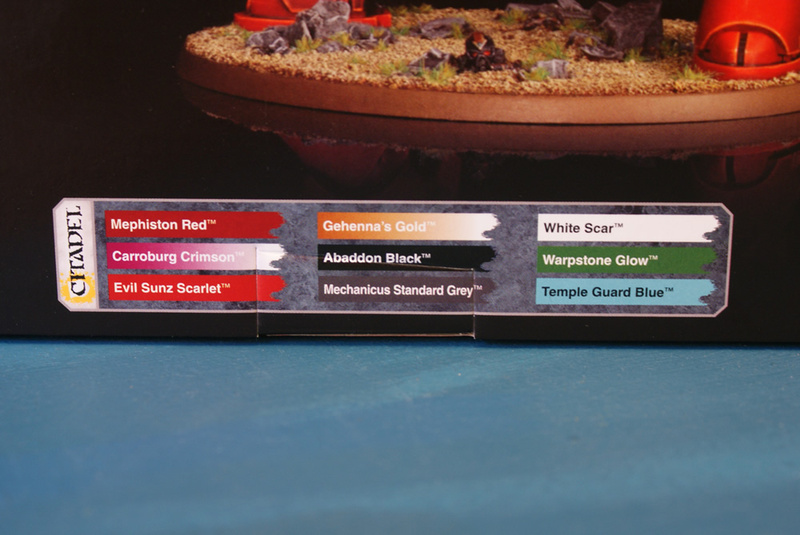 You would need very large hands to hold the nine paints listed on the back of the Wraithknight box. 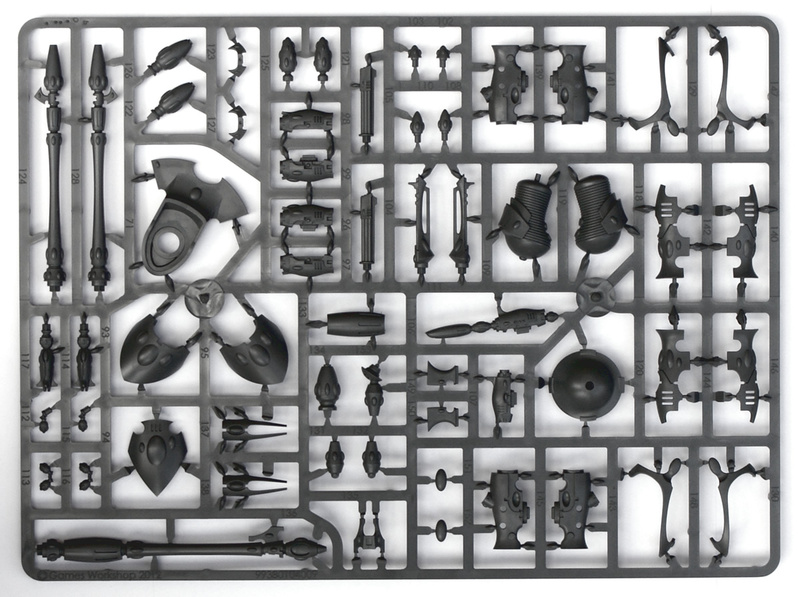 Lastly, value for money, at £70 RRP the Wraithknight is a little on the expensive side, even for a model of it’s size – a Baneblade is far bulkier and is the same price. 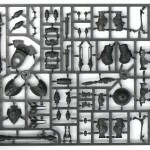 The Eldar Wraithknight boxed set contains 114 components and can be equiped with either heavy wraith cannons, a suncannon, ghostglaive or scattershield. 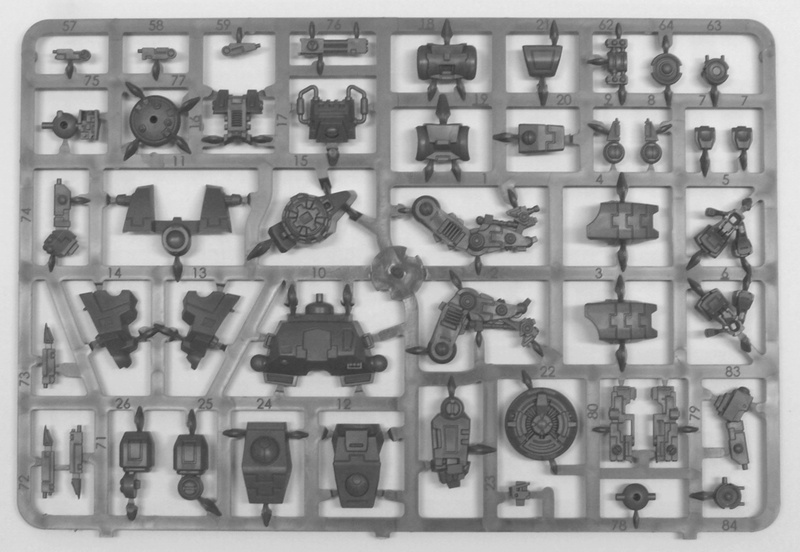 Additionally the kit comes with a number of shoulder mounted support weapons including starcannons and shuriken. 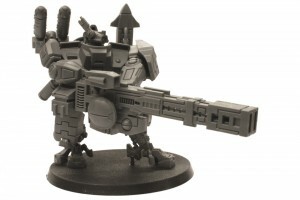 However, at £70 RRP the Wraithknight is a little on the expensive side, even for a model of it’s size – a Baneblade is far more substantial and is the same price.